Written in the Rogers Reunion Photo Album Volume 1 "Mr and Mrs Iddings, parents of Warren "Warry" Iddings. Younger woman unknown"
The "Rogers Reunion" was a reunion of the descendants of Joseph and Hannah (Clarke) Rogers who moved from Pennsylvania to a farm near Polo, Ogle County, Illinois. William Alfred Dew, a descendant of Joseph and Hannah, started collecting photographs of the descendants. After his death, his son Robert Edwin "Ed" Dew maintained and added to the collection. Following Ed's death, no one in his family wanted the albums. Ed and I had collaborated on the descendant booklet published for the 100th reunion. His family sent me the albums. Lewis was the son of James "Billy" Iddings and Jane Meredith. 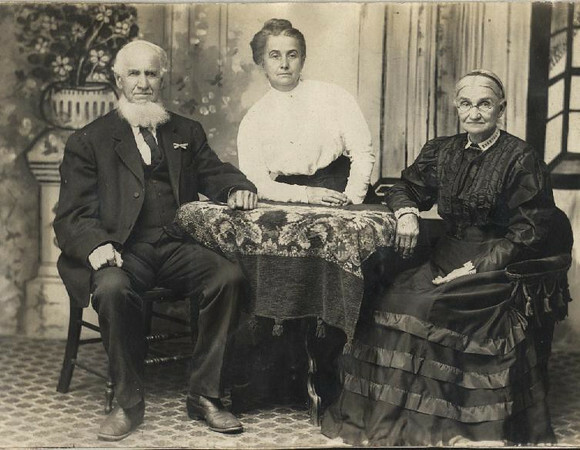 Jane was the daughter of Uriah Rogers and Hannah I Rogers. Uriah and my Joseph, who married Hannah Clark, were brothers.